A couple of weeks ago I got nominated for the Beauty Blogger Award… now that’s something I am a bit proud of I must admit (beaming from ear to ear now!!). And I was so glad that it was the lovely Dominique of www.styledomination.com that put me up for this award. I have been following Dominique’s blog for some time now and she really is a fun, honest and beautiful person. I like her blog a lot. It’s versatile, the posts read very easily and the blog is beautifully designed which is of course always a bonus for the readers! 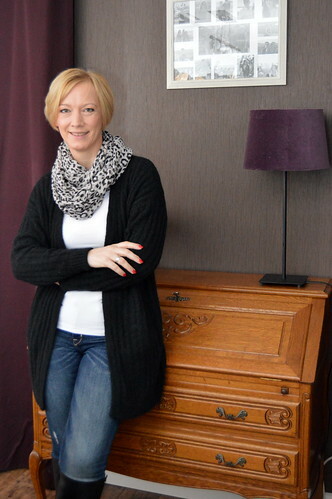 So thank you Dominique for nominating me… it’s an honour and a pleasure to answer your questions! Which famous makeup artist inspires you the most? As a proud Belgian I would have to say fellow-Belgian Peter Philips, the creative and image director of Christian Dior make-up… His runway looks are always so innovating and he is certainly one of the biggest influencers in beauty. Here you can read an interview with this truly magnificent artist who puts Belgium on the beauty world map! That definitely is good old Vaseline. I used to have really chapped lips and I have been using various lip balms over the years… with various results! 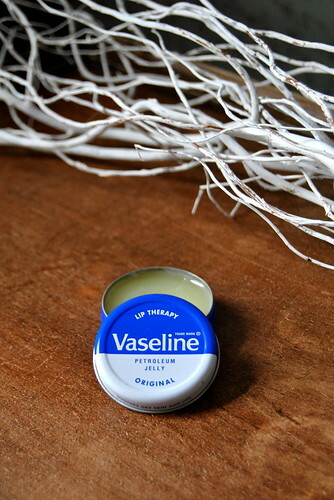 But ever since I started using Vaseline on my lips before going to sleep, my lips are so much softer! If you could change anything about your blog, what would it be? Definitely my spelling/grammar mistakes… I’m not a native English speaker, but as I was always attracted to the English language, it felt only natural to me to write my blog in English. I tried writing posts in Dutch, but I just couldn’t write as fluently as I write in English. I guess that’s because I have been working in administration for nearly 20 years and the Dutch I write is always so business-like. Anyway, writing in English makes me learn heaps of new words and phrases! Which celebrity’s style influences your look? I honestly do not know… My look varies so much! I wear what I am feeling comfortable in at the time. So one day I’m wearing a skinny with a t-shirt and a woollen cardigan, the next day I’m wearing a lace skirt! Below you see some of my latest outfits… if you think I’m influenced by some celebrity, please do tell as I am eager to know 🙂 ! If you could have dinner with anyone in the world, who would it be, past or present? The first names that sprung into mind were of course : Brad Pitt…or no… Gerard Butler… or perhaps Jamie Dornan… and why don’t you throw in David Beckham, Johnny Depp and Keanu Reeves as well ! No… I would like to have dinner with my mother-in-law who left us way too early. And we would make a big feast of it… together with my father-in-law, her children and grandchildren. Having a good old Sunday lunch together… with profiteroles as dessert… Oh I would give up much to have that chance! Who is your favourite beauty blogger? Confetti and Curves is the blog from Karen, a UK blogger. It was one of the first blogs I started following and I still like browsing it… Karen has a fun style of writing and her beauty posts are mainly about the affordable high street brands. I also like By Isabelle from (you’ve guessed it!) Isabelle. 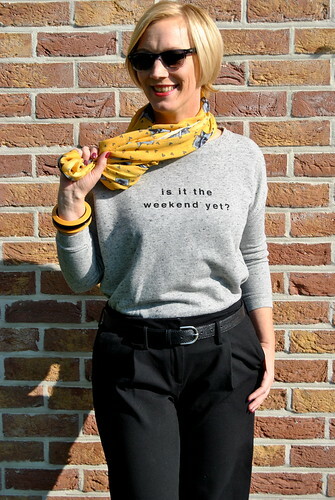 She is a Belgian blogger and I really like her reviews! She really puts much time and effort in them. She writes in Dutch so all you Dutch-speaking people go and check out her blog!!! (And the other ones can also check it as she puts lots of nice photos on it 🙂 ). If you could drop everything and travel anywhere, where would you go? 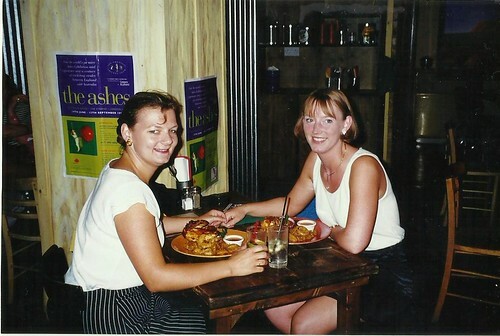 Katelijne and I in London way back in 1997, on one of her visits to Europe. What makeup would you buy if you received a $100 giftcard to Sephora? I definitely would want to try out an eyeshadow palette from Urban Decay to see what all the fuss is about… Is it really as good as I read on all those blogs and in all those magazines?!?! I would probably go for this Naked2 palet as I really like the shades. I used to buy Double Wear from Estée Lauder. For the last couple of years I have been using foundation from high street brands though, as they got so much better ànd they are much cheaper. A giftcard woud be the perfect change for me to buy Double Wear again and see if it beats my current foundation (which is Max Factor Face Finity of which you can read a review here). Mascara… I’ve got those little, unnoticeable eyelashes… If I don’t use mascara, people think I’m ill!! 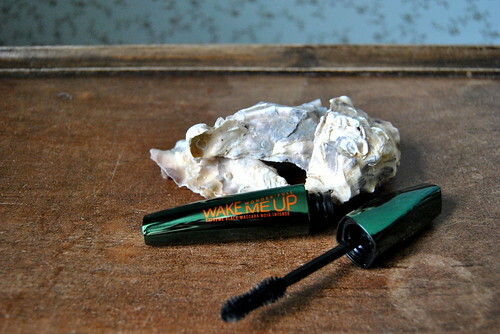 At the moment I am using Rimmel Wake me up mascara of which you can read a review here. I hope you enjoyed reading these anwsers. Perhaps you got to know me a bit better now! Which period of time would you like to live in? Name 3 basic fashion items you couldn’t live without? Plastic surgery… yay or nay? How old are you… but how old do you feel? Which beauty products are always in your handbag? Which beauty tip from your (grand)mother do you still use today? At what age did you start using make-up? I am so looking forward to all your answers… we can definitely learn from them! But… this award should be fun… so don’t feel obligated to participate! This entry was posted in blogging, Lifestyle, Miscellaneous, Personal and tagged award, beauty, beauty blogger award. Ik ga mijn best doen om je vragen binnenkort eens in te vullen 😉 en thanks voor de nominatie!! I will pick it up and answer your questions 😉 Thanks for the nomination! Oooh, thank you for my nomination! I will see if I can get to these! Olà senorita! Fabulous answers! And love your “broken english” quote – it’s so true! 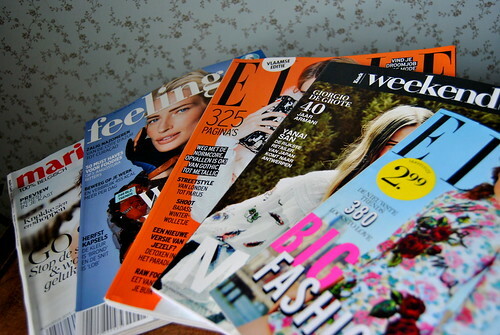 I am loving your blog and style shots! Congrats again on your award – you truly deserve it! And if you go to dinner with Johnny Depp, invite me. LOL! Urban Decay is totally worth the fuss 😉 and I LOVE Karen! She’s such a sweetheart and her blog is always so much fun to read!